WHO will support Ireland in assessing options for reforming its health system in response to the financial crisis, Dr Hans Kluge, Director of the Division of Health Systems and Public Health in WHO/Europe, assured the Irish Minister of Health Dr James Reilly at the end of a discussion with senior policy-makers in Dublin. 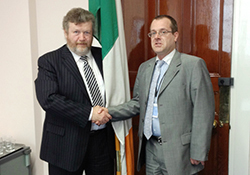 Dr Kluge met with the minister at the end of a policy dialogue on 16-17 July 2012. At the dialogue, leading international experts shared with senior representatives of Ireland’s Department of Health and Children evidence and experience from other European countries facing similar challenges. Ireland is one of the countries hit hard by the financial crisis. Its economy entered a deep recession in 2008, and austerity measures to compensate for the decline in income led the country to assess various options for reforming its health services while cutting health budgets. The 38 participants in the policy dialogue reviewed the available data on the effects of resource reduction on the Irish health system. They explored Ireland’s policy options for reform in comparison with responses in other countries belonging to the European Union and the Organisation for Economic Co-operation and Development (OECD). Experts from the European Observatory on Health Systems and Policies, WHO/Europe and its Barcelona Office for Health Systems Strengthening facilitated the discussions, and provided recent literature and data. Representatives of major academic institutions – including Berlin Technical University, the London School of Hygiene and Tropical Medicine, the London School of Economics and Trinity College Dublin – presented international perspectives. The participants discussed a draft report on the Irish health system’s response to the financial crisis, prepared by WHO/Europe and the Observatory, in the light of the evidence presented. In addition, WHO will assist the Department in establishing processes to measure the outcomes of primary health care in Ireland.